A simple, innovative and profitable franchise system. Gutter-Vac is an exciting business opportunity that is perfectly positioned in the booming home service industry. It is also a great franchise for those who want their own business, a great lifestyle or be an entrepreneur. Want to learn more? Download our franchise booklet. Download our FREE franchise booklet. We are on the hunt for motivated & passionate franchisees who are looking for a lifestyle change. 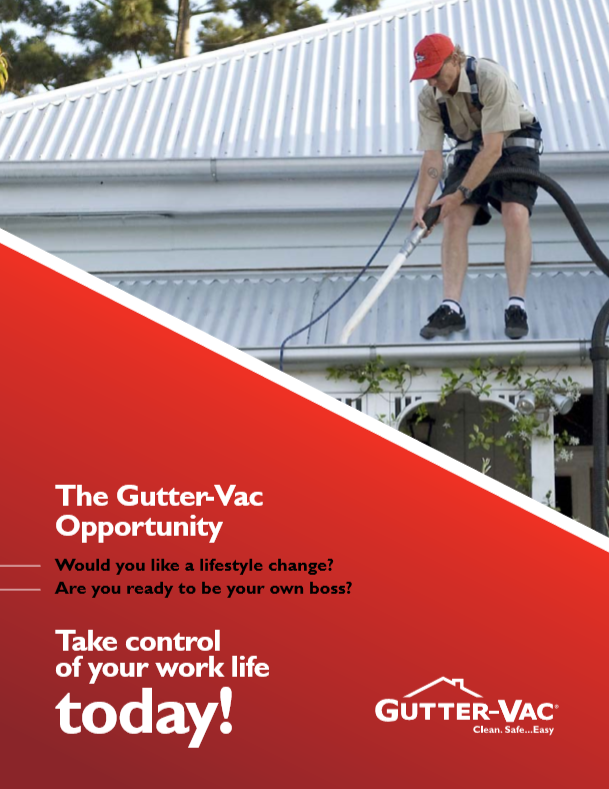 If you’re sick of the rat race, make a change with a Gutter-Vac franchise. After 20 years, we know what does and doesn’t work. With a Gutter-Vac franchise, you gain access to vital knowledge that has been developed and improved across our 80+ Australian locations. No licence or experience is required, as we provide comprehensive training over seven days at our head office. We provide practical training, as well as training in operations, safety, customer service, and marketing, just to name a few areas. Receive up-to-date and comprehensive marketing training and tools. We stay in touch with the latest in both traditional and digital marketing and are always here to provide support. Our support program is not only in-depth but essential to the successful operation of your Gutter-Vac franchise. The team at head office are always on hand to provide ongoing support to help you grow your business. Receive an exclusive territory when you buy your Gutter-Vac franchise to grow and build your business within. At Gutter-Vac, we use unique, specialised vacuum equipment to get the job done quickly and effectively. Get a lifestyle with a Gutter-Vac franchise. Set your own hours and workload, and be your own boss. Gutter-Vac has allowed my family to have financial freedom. Head Office are extremely helpful, and the Directors have always been there to offer assistance. If you are willing to put the hard work into a Gutter-Vac franchise, you are guaranteed to be a success. Complete the form below to find out more about this exciting franchise opportunity.